Founders College was the first college established on the Keele campus. Glendon Campus was the first site of York University. Since 1965, the College, its Academic Leaders, Fellows, and students have participated actively in the development of a new university. 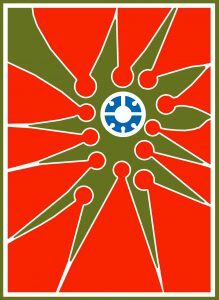 The orange and green College banner, designed by a distinguished Canadian artist, Harold Town, symbolizes the University at the centre of a twelve-college sun burst. Between the spurs of the banner one can also see stylized figures that are a reflection of the twelve aluminum figure sculpture placed above the main entrance to the college in the quadrangle. October 15, 2015 marked Founders College fiftieth anniversary. 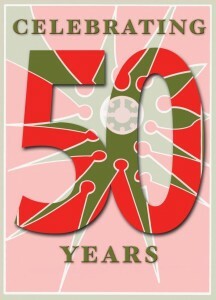 To commemorate and celebrate this milestone, the College commissioned the design of special banner to be used throughout this celebratory year.